A Malaysia Airlines Boeing 777-200 carrying 239 people lost contact over the South China Sea early Saturday morning on a flight from Kuala Lumpur to Beijing, and international aviation authorities still hadn't located the jetliner several hours later. Photo Credit: Loren Callahan/AP Photo --- A Boeing 777-200IGW, like the one pictured, has gone missing while inflight from Kuala Lumpur to Beijing, March 7, 2014. The plane lost communication two hours into the flight in Vietnam's airspace at 1:20 a.m. (18:20 GMT Friday), China's state news agency said. The radar signal also was lost, Xinhua reported. Fuad Sharuji, Malaysian Airlines' vice president of operations control, told CNN that the plane was flying at an altitude of 35,000 feet (10,670 meters) and that the pilots reported no problem with the aircraft. He said that the aircraft's last communication was over the South China Sea between Malaysia and Vietnam. Flight MH370 departed Kuala Lumpur at 12:41 a.m. Saturday (16:41 GMT Friday) and was expected to land in Beijing at 6:30 a.m. Saturday (22:30 GMT Friday), Malaysia Airlines said. The plane was carrying 227 passengers, including two infants, and 12 crew members, the airline said. Passengers were from at least 12 countries, including 152 from China, seven Australians and four Americans. The airline said it was working with authorities who activated their search and rescue teams to locate the aircraft. The route would take the aircraft from Malaysia across to Vietnam and China. "Our team is currently calling the next-of-kin of passengers and crew. Focus of the airline is to work with the emergency responders and authorities and mobilize its full support," Malaysia Airlines CEO Ahmad Jauhari Yahya said in a statement. "Our thoughts and prayers are with all affected passengers and crew and their family members," he added. All countries in the possible flight path of the missing aircraft were performing a "communications and radio search", said John Andrews, deputy chief of the Philippines civil aviation agency. At Beijing's airport, Zhai Le was waiting for her friends, a couple, who were on their way back to the Chinese capital on the flight. She said she was very concerned because she hadn't been able to reach them. Airport authorites posted a written notice asking relatives and friends of passengers to gather to a hotel about 15 kilometers (9 miles) from the airport to wait for further information, and provided a shuttle bus service. Another woman wept aboard the shuttle bus while talking by mobile phone, " They want us to go to the hotel. It cannot be good!" 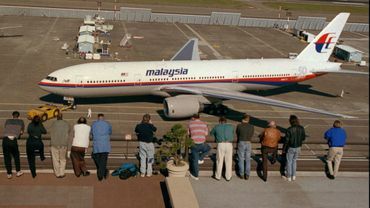 Malaysia Airlines last fatal incident was in 1995, when one its planes crashed near the Malaysian city of Tawau, killing 34 people. Malaysia Airlines has 15 Boeing 777-200 jets in its fleet of about 100 planes. The state-owned carrier last month reported its fourth straight quarterly loss. The 777 had not had a fatal crash in its 20 year history until the Asiana crash in San Francisco in July 2013. All 16 crew members survived, but thee of the 291 passengers, all teenage girls from China, were killed. Associated Press writers Chris Brummitt in Hanoi, Vietnam, Didi Tang and video producer Aritz Parra in Beijing, China, contributed to this report. Let's just hope this is weather interference and the Air Traffic Controls are not able to contact the jet. There are at least 4 Americans on board. I do hope this jet lands safely. If you do pray, this would be a good time to offer prayers or good thoughts for the families waiting to hear what has happened. Yes, been listening /watching ever since the news broke, let's hope for the best. China's state media say Vietnamese authorities have detected signals from the missing Malaysia Airlines plane. The Xinhua News Agency, citing a local Vietnamese media report, says a Vietnamese search and rescue official reported that the signals have been detected from the plane from about 220 kilometers (120 miles) southwest of Vietnam's southernmost coastal province of Ca Mau. Malaysia Airlines says its Boeing 777-200 carrying 239 people lost contact over the South China Sea early Saturday morning on a flight from Kuala Lumpur to Beijing. Please do post any updates and information so we can all follow. North Korea fired missile into path of plane with 200 people on board, Seoul says! Malaysia Airlines incident: Six Australians on plane missing en route to Beijing. "The plane was flying from Tokyo's Narita airport to the northeastern Chinese city of Shenyang on Tuesday, the ministry said." O yes JL A i know it was a separate incident, forgot to mention it was the other day but do we trust young Kim playing with missiles that have already gone too close to a passenger plane. HANOI: A Vietnamese rescue official denied that the signal of the missing Malaysian plane has been detected, China's Xinhua news agency reported on Saturday. Pham Hien, director of the Vietnam's maritime search and rescue coordination centre zone 3, told Xinhua Saturday that the information that the signal of the plane has been detected at some 120 nautical miles southwest of Vietnam's southernmost Ca Mau province is incorrect. Sadly this one includes a report that the airline was seeking approval to replace some of its planes. KUALA LUMPUR� The missing Malaysia Airlines flight MH370 carrying 239 people has crashed off the Tho Chu island in Vietnam, leading local daily Tuổi Trẻ reported today. According to the report, the Vietnamese High Command of Navy issued a statement to confirm that the Boeing B777-200 aircraft went down some 300km off the island located near Cape Ca Mau in Vietnam�s Kien Giang Province. The report added, however, that there are no reports of any casualties as yet. MAS has yet to confirm the reports. Wiki indicates :"Thổ Ch�u commune has about 500 households with nearly 2,000 inhabitants, most of whom are border guards and navy personnel who chose to settle on the islands; the rest are immigrants. Local residents' livelihood are providing service for fishing boats, small craft production, farming, animal husbandry and fishing along the coast." Which might mean better locale in terms of human skills for a sea rescue than many places. The families of all passengers on board MH370 are being informed. The flight was carrying a total number of 239 passengers and crew � comprising 227 passengers (including 2 infants) and 12 crew members. OK. One of these climate-killer-machiness less. Thousands and thousands to go. Your compassion for those have lost their life and the family members is missing, David. You might consider that someone reading those cold impersonal words could be related to someone on that plane. This is not the time for a lecture rather a time to feel for your fellow beings that most probably have lost their life. Currently, Air and Sea Rescue operations are working to recover the plane, they know where the oil slicks are and rescue operations are working in that area of the south China sea. This is as one might expect a mufti-national rescue effort. Thank you AniMae and J L for posting continued information and updates on this tragedy. How sad.... Hopefully they will find out the cause of the crash, to prevent occurance. This is crazy! If, as possibly alleged, North Korea did fire a missile that affected this plane, then it's an act of war. There are so many conspiracy theories surfacing right now it's impossible to know what is and isn't true. The one truth we all know is that if people on that plane are still alive, they're suffering, and if not, then many, many families need our compassionate thoughts and prayers. One article stated that at least two passengers were flying on stolen passports. Thanks for posting this. I did not hear until today. Too sad,may the ending be good to read. May those passengers RIP. Thanks. Tragic ... compassionate thoughts for all missing passengers, their family & friends. Missing Malaysia Airlines plane: stolen passports raise terrorism fears! Until the plane is recovered we can not know what is conjecture and what is fact. Let's do try to keep the conspiracy theories in check until we do know what happened. It is also somewhat amazing to me that even now, after all that time there are still no accurate and more detailed news out on this tragedy..not a good sign. Although a plane missing for this long doesn't seem like the outcome will be good, I'm still hoping for the best...and not succumbing to conspiracy theories. It very well could've been a mechanical problem. I don't know if it's possible at this time, but I hope there will be survivors---and my heart goes out to the families of all onboard. I too cling to hope, Lois. Though I admit that is fading fast. "Among the Freescale Semiconductor employees aboard Flight MH370 were 12 people from Malaysia and another eight from China, president and CEO Gregg Lowe said." Missing Malaysia plane: What could have happened? Good summary of technical possibilities. The search is continuing for a Malaysia Airlines plane that has been missing for more than 24 hours. Marine rescue teams worked through the night to search the sea south of Vietnam, while the aerial mission resumed on Sunday morning. Flight MH370 disappeared en route to Beijing from Kuala Lumpur, with 239 people on board. I feel very sad looking at the anguish and pain on the faces of those waiting to hear news. The US Navy is sending the USS Pinckney - to assist with search and rescue efforts. Asked whether terrorism was suspected as a reason for the plane's disappearance, Malaysian Prime Minister Najib Razak said: "We are looking at all possibilities, but it is too early to make any conclusive remarks." In a statement, the airline urged "all Malaysians and people around the world to pray for flight MH370". The plane vanished at 17:30 GMT Friday (01:30 local time Saturday). It reportedly went off the radar south of Vietnam. According to Malaysian Airlines, it last had contact with air traffic controllers 120 nautical miles off the east coast of the Malaysian town of Kota Bharu. Distraught relatives and loved ones of those on board are being given assistance at both the arrival and departure airports. To be left in the dark without any knowledge for so long MUST be near unbearable horror for the families and hope fading with each hour passing, we can only send our strong thoughts and prayers. With all of nowadays modern technologies of surveillance I find it hard to understand that not a single piece of that aircraft was detected so far, other than the huge oil trail. An Al Jazeera reporter on the scene said there is some concern that the oil slicks are from ships and not the plane. That is a shipping port. So far nothing from the jet has been recovered. Yes, Angelika I have no doubt the families are in terrible anguish. Looking like terrorism could be the cause. Sad story for the families. Could be terrorism possibly. (Reuters) - Malaysia Airlines said it was "fearing the worst" on Sunday for a plane carrying 239 people that went missing more than 24 hours ago, as the government said it was investigating four passengers who may have held false identity documents. There were no reports of bad weather and no sign of why Flight MH370 would have vanished from radar screens off the coast of Vietnam about an hour after it took off from Kuala Lumpur bound for Beijing early on Saturday morning. European officials said it appeared two people on board were using stolen passports and Malaysian Transport Minister Hishamuddin Hussein said authorities were also checking the identities of two other passengers. "All the four names are with me," said Hishamuddin, who is also defense minister. "I have indicated to our intelligence agencies and I have also spoken to international intelligence agencies for assistance." He said help was also being sought from the U.S. Federal Bureau of Investigation (FBI). However, an attack was only one of the possibilities being investigated. "We are looking at all possibilities," he said. "We cannot jump the gun. Our focus now is to find the plane." The Chinese official Xiamen Daily reported that one of the passengers who was supposed to be on the flight, according to the manifest, was at home in China. The name on the passport and the passport number did not match, according to the newspaper. It was not immediately clear if the Chinese person's identity was among those being investigated. There were no confirmed signs of the plane or any wreckage on Sunday, well over 24 hours after it went missing. Search operations continued through the night, officials said. "In fearing for the worst, a disaster recovery management specialist from Atlanta, USA, will be assisting Malaysia Airlines in this crucial time," the airline said in a statement. Vietnamese naval boats sent from the holiday island of Phu Quoc patrolled stretches of the Gulf of Thailand, searching for any wreckage, scouring the area where an oil slick was spotted by patrol jets just before nightfall on Saturday. "Our two rescue boats have approached the two oil spills since 3 a.m. today but we haven't found any sign of the Malaysian plane yet. Other boats are ready to go to support if needed," Admiral Ngo Van Phat told Reuters. There were no indications of sabotage nor claims of an attack. But the passenger manifest issued by the airline included the names of two Europeans - Austrian Christian Kozel and Italian Luigi Maraldi - who, according to their foreign ministries, were not on the plane. A foreign ministry spokesman in Vienna said: "Our embassy got the information that there was an Austrian on board. That was the passenger list from Malaysia Airlines. Our system came back with a note that this is a stolen passport." Austrian police had found the man safe at home. The passport was stolen two years ago while he was travelling in Thailand, the spokesman said. The foreign ministry in Rome said no Italian was on the plane either, despite the inclusion of Maraldi's name on the list. His mother, Renata Lucchi, told Reuters his passport was lost, presumed stolen, in Thailand in 2013. U.S. and European security officials said that there was no proof of foul play and there could be other explanations for the use of stolen passports. A Malaysian official with knowledge of the investigation said the passengers being checked had all bought their tickets through China Southern Airlines, which was code-sharing the flight with Malaysia Airlines, the official said. Passengers on board the flight included 20 employees of Austin, Texas-based chip maker Freescale Semiconductor Ltd. Twelve of the employees were from Malaysia and eight from China, the company said in a statement. The 11-year-old Boeing 777-200ER, powered by Rolls-Royce Trent engines, took off at 12:40 a.m. (11.40 a.m. ET Friday) from Kuala Lumpur International Airport when it went missing without a distress call. Aboard were 227 passengers and 12 crew. Flight MH370 last had contact with air traffic controllers 120 nautical miles off the east coast of the Malaysian town of Kota Bharu. Flight tracking website flightaware.com showed it flew northeast after takeoff, climbed to 35,000 ft and was still climbing when it vanished from tracking records. A crash would likely mark the 777's second fatal incident in less than a year, and its deadliest since entering service 19 years ago. An Asiana Airlines Boeing 777-200ER crash-landed in San Francisco in July 2013, killing three passengers and injuring more than 180. Boeing said it was monitoring the situation but had no further comment. Paul Hayes, director of safety at Flightglobal Ascend aviation consultancy, said the flight would normally have been at a routine stage, having reached initial cruise altitude. "Such a sudden disappearance would suggest either that something is happening so quickly that there is no opportunity to put out a mayday, in which case a deliberate act is one possibility to consider, or that the crew is busy coping with what whatever has taken place," he told Reuters. A large number of planes and ships from several countries were scouring the area where the plane last made contact, about halfway between Malaysia and the southern tip of Vietnam. "The search and rescue operations will continue as long as necessary," Malaysian Prime Minister Najib Razak told reporters. He said his country had deployed 15 air force aircraft, six navy ships and three coastguard vessels. Besides the Vietnamese vessels, China and the Philippines also sent ships to the region to help, while the United States, the Philippines and Singapore dispatched military planes. China also put other ships and aircraft on standby. The disappearance of the plane is a chilling echo of an Air France flight that crashed into the South Atlantic on June 1, 2009, killing all 228 people on board. It vanished for hours and wreckage was found only two days later. John Goglia, a former board member of the National Transportation Safety Board, the U.S. agency that investigates plane crashes, said the lack of a distress call suggested that the plane either experienced an explosive decompression or was destroyed by an explosive device. "It had to be quick because there was no communication," Goglia said. He said the false identities of the two passengers was "a big red flag". If there were passengers on board with stolen passports, it was not clear how they passed through security checks. International police body Interpol maintains a database of more than 39 million travel documents reported lost or stolen by 166 countries, and says on its website that this enables police, immigration or border control officers to check the validity of a suspect document within seconds. No comment was immediately available from the organization. Our press reports today state harsh criticism of Malaysian officials and security controls by Interpol for not having done the stolen passport data checks which had been ordered and reminded to be done repeatedly. US agencies for surveillance have no signs of lightning recorded in the area where a possible explosion in the air could have occured. This suggests that the aircraft probably sunk to the ocean (would be the case if pilot/s were forced at gunpoint to deliberately render the plane unmanageable, as was the case in 1999 Egypt Air crash that went down into the Atlantic ocean after take-off from NY when the pilot himself forced the crash) and only exploded there upon touching the water, if at all. But a detonation on board with immediately tearing apart the aircraft (Lockerbie) without much lighning to be detected could also be possiblle. To me it undoubtedly looks like a hijacking (Vietnamese military did observe a U-turn taken by the aircraft) and terrorist attack. I just checked the news wires and there is no current information. This is a multi-nation search and rescue and I will keep my hope intact until we have some kind of confirmation. My heart hurts for the possibility of terrorist attacks and 300 souls taken for nothing more than political statements. Right Kit, so does my heart and i'm afraid that is what it will come down to. And it has ALWAYS cost innocent lives , numbering in the tens of thousands by now, when there were such statements made by extremists. CNN shortly ago in their coverage mentioned a petition the family members kept in limbo have alledgedly put on, demanding the truth from Malaysian officials whom they accuse of withholding information. I have a feeling that they are releasing information as they can. Making direct accusations before all the facts are known can not be of much use to anyone. It seems to be a possible terror attack because of the passports. We might find that sudden engine failure was the cause. They must find the Black Box and as much of the plane as is possible and that will take some time. Air crew and passengers foiled an attempted hijacking of a plane Friday noon in China's far west Xinjiang Uyghur Autonomous Region, local police said. Six people tried to hijack Tianjin Airlines' Flight GS 7554 just 10 minutes after it took off from Hotan Airport at 12:25 am, en route to the provincial capital Urumqi, according to the region's Public Security Bureau. "All six of the hijackers were ethnically (Muslim) Uyghur, and they tried to break into the cockpit using a broken crutch as a weapon, but were overpowered by passengers and crew," Hou Hanmin, chief of the regional information office, told the Global Times, adding that investigation is ongoing and whether the hijackers are part of a terrorist group remains unclear. Very co-incidental that a predominantly Chinese passenger plane disappears just after the attempt to take a Chinese plane. This is a modern plane which "talked" to Malaysian control telling it frequently that it was OK. There was a period of time when communication ceased and it was unlikely that it was just a breakdown. There was also a suspicion that the plane may have turned back to Malaysia. So we have a plane where communications were deliberately (or accidently) disrupted. Only a terrorist act could have made such a cataclysmic failure as aircraft have several backups. It is possible, but unlikely, that the 2 people who used stolen passports and bought the tickets together, weren't terrorists, but unlikely. My heart goes out to those who have lost family and friends to these terrorists. And Kit, before you start pontificating about conspiracy theories, remember that I have always been right. Most terrorists are Muslim even though not all Muslims are terrorists. That incident mentioned above happened somewhere else of course, but it could have been skipped for reports on prupose not to highten fear about this other missing one MH370 en route to Beijing. Kit, I fully realise that but yet I find it very inappropriate to leave the relatives of the missing passengers uninformed and having to learn any info from social media via their devices, what everyone else hears from the media. Psychological and physical care and attention is not enough I think. They certainly deserve to know what the rest of the world knows. A sudden total technical failure seems much less likely to me as search teams would have probably found a large pattern of debris in the water if that plane had blunged down and burst only when hitting the water, contrary to previously having disintegrated at flight altitude which was about 35 K feet. The "suspicion" of turning back mentioned by Gillian, also seems to get acknowledged more and more by media, after Vietnamese military had already stated the same earlier. Angelika, we don't know what the families know, I expect that they would be told the truth as the authorities know that they would hear it from news reports. Sadly, there is little hope that any will be found alive. The one thing I do know about disasters, having taken part in training sessions with emergency services, is that the media is a pain. Instead of having his/her mind on whatever the disaster is, the person in charge has to talk to media or decide what they should hear. What I know is that none of us knows much of anything about this. In time we will know more and I hope that is sooner than later. Yes, I read and posted that an ATC said the plane made a U - turn but without contacting the controllers, that would be very dangerous. Each plane as a "pcoket: of air space and without contacting the ATC the pilot could not know that he/she was not heading directly into the path of another jet. So much speculation and so few hard facts. Thanks for continuing the updates Kit. Sorry but right now the updates are just a repeat of what we know that we don't know. The plane may have made a U - turn and now that more rescue ships are on the scene we may get more news in the next 12 hours. We'r e hearing the same over here, no news, no debris found, oil slick samples still in lab for tests. The only thing new perhaps being that both passengers travelling with those stolen European passports were looking "Arab" according to the surveillance cameras at check in. Now that nothing not even the Black Box beacon is detected and the oil slick has been found to be from ships and not the jet liner; the search teams will move some to attempt a search in Rain Forests of Malaysia, while continuing to move the search into different areas of the ocean. Even with an explosion, some remnants of the plane should have surfaced in the ocean. The Black Box beacon may be signaling but has not yet been detected. Another day with scant news. The passports in question are being investigated. If anyone remembers the Lockerbie jet bombing in Scotland from 1989, Al Jazeera has done an exemplary documentary on the details of that investigation. If the aircraft exploded over land and not sea it might be more difficult to detect the blackbox with no devices within the range of signals. Should the assumptions of a U-turn be incorrect, I wonder if the plane could have even reached Vietnamese mainland and crashed there? There were suggestions it could have flown for a while outside of radar reach. Thanks to Ros and Angelika for the updates. Ros I do appreciate that in Australia you probably get more immediate and detailed news reports. I certainly do not envy the officials with their daily duty to address the media and public, having near to no news at all to be announced... Heading into day 5 soon, will we learn anything and what? It appeared much easier to track any space travel to another planet than this missing aircraft which could not really have gone very far. Unspeakable what the relatives have been forced to bear. "Malaysia-Truly Asia" ..hmm, certainly this slogan will have a bitter taste to it for many from now on for a while..
Ros, that is very true what you mention and it was not beneficial at all for all those seeking asylum, that the public word from authorities was about "vast human trafficiking" now in context with this MH370 tragedy..
..ongoing guessing games,confusion, speculations and tons of questions still..
Thx Ros, nothing new in there, it is identical with CNN reports which I've been following ever since, plus BBC world. Except for that "blue light seen by..", I've heard all this before. As for the "hell hole" on that island, I've been aware of this as well for quite some time, David B had posted about it long time ago. True, an extremely confusing story so far. Now we're waiting if these new Chinese satellite images prove to be the crash site... enough indications that they actually are. I guess it's fair to summarise today's news as "the plane simply vanished" - unprecedented case. Are we witnessing a huge cover-up here? How serious can the latest suggestions be taken that "US Investigators Think Missing Plane Might Have Been Stolen To Use Later For Another Purpose" ? I see folks stopped commenting here, can't blame them..
After all the latest news and suggestions I am wondering why the talk is just about the Indian ocean and Andaman islands area. Given the hours they said the plane could have continued to fly and perhaps did, it could have made it to at least Sri Lanka or mainland India. Fuel would have been sufficiant even to reach Somalia, had there been any intention and tech ability to go towards Afrika. Any crash as well as any landing anywhere should have been observed/picked up, but would it have been made public might be a different question. As some FACTS appear to have finally emerged, still speculations have even decreased and getting wilder by the day and hours. They now speak of 24 countries being involved in the search operation, huh? 2 days ago it were 14... and now it's a criminal investigation and some paper suggests it may have been a planned attack on Diego Garcia..(US baes in Brits Indian ocean territory), hence the Southern route as one option. Also a possible link to Malaysian opposition politician Anwar Ibrahims' court sentence of 5 years jailtime for homosexuality just hours prior to the flight was pointed out. Flight captain Zaharie Ahmad Shah, now under investigation, was a follower of Ibrahim's party (PKR =Parti Keadilan Rakyat) and was seen in court during the sentencing. I meant to say speculations have INCREASED, NOT decreased.